His column, "It's Kind of a Funny Story" has run here at the True Dork Times since 2017, when he first wrote about season 34, Survivor: Game Changers. Dan Otsuki takes a literal spring break from law school to describe how this season is like a Survivor spring break: lots of beaches, filled with lots of people you don't know, and so on. In his final Heroes v. Healers v. Hustlers column, Dan assesses the outcome of the season, determines the archetypes of the final five contestants, and has some hot takes on the winner and runner-up, that F4 twist, and the next season, Ghost Island. Dan takes a parting look at Ashley's archetype and lots (lots!) of idols, then sorts the mere contenders from the potential champions heading into the season finale of Heroes v. Healers v. Hustlers. Dan contrasts the balanced play of Lauren with Ben's chaotic turn, and with Mike's nothing-to-lose approach, as they collided in Episode 12 of Heroes v. Healers v. Hustlers. Also some thoughts on the loved ones visit and what it tells us about where the season might end up. Dan argues that the story shows the rise of Devon and Ashley may be a red herring, why Lauren reminds him of Natalie White, and where the season may be heading after Episodes 10-11 of Heroes v. Healers v. Hustlers. Dan takes a stream-of-consciousness, somewhat scotch-aided tour through the highs, the lows, and head-scratching-even-while-sober events of Episode 9 of Heroes v. Healers v. Hustlers. Dan praises the secret feasts and the big discoveries by Lauren and Ryan, explores Cole's lack of gameplay, questions the tone of Ben's edit, and peers into the future beyond Episode 8 of Heroes v. Healers v. Hustlers. Following the merge, Dan looks at Ben's and Lauren's decision as one between royalty and comic relief, notes the importance of the merge vote, and finds an underdog who might overcome the long odds of being on the wrong side of it. Dan laments the loss of Ali (for TV purposes), then gathers himself to project the post-merge likelihood of success for the remaining dozen players of Heroes v Healers v Hustlers. Dan takes a critical eye to Ryan's big move, and posits its long-term significance, and praises Ben's moment, Mike's find, and Chrissy's manipulation. He also holds out hope for an Ali comeback after the fifth episode of Heroes v Healers v Hustlers. Dan finds problems with three key characters, praise for three new couples, and a divided opinion on short-lived but luck-based twists, as in the fourth episode of Heroes v Healers v Hustlers. With horror shows on his Friday-the-13th mind, Dan praises the show's focus on ill-advised, bumbling gameplay, plus the surprisingly good showings of two previously overlooked contestants. Dan looks at the importance to the narrative of people playing the roles of literary fools (of various types) in the second episode of Survivor: Heroes v Healers v Hustlers. Dan takes time to pay tribute to the unfortunately undershown first one out of Survivor: Heroes v. Healers v. Hustlers, then looks in depth at the bevy of duos pairing up in the season premiere. 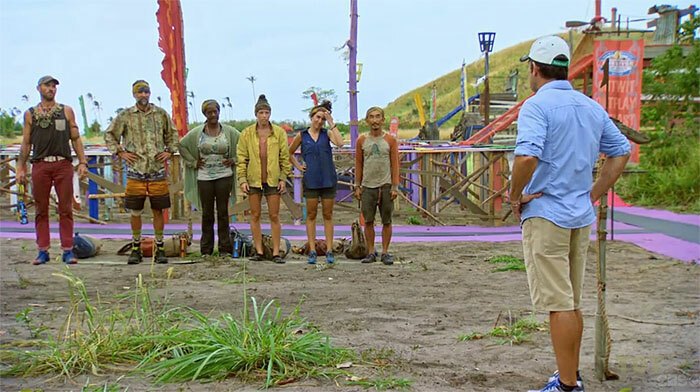 Dan looks back at the narrative arcs of the Game Changers final six, evaluates Sarah's winning game and the new jury format, suggests some idol improvements, and looks ahead to next season. Dan reviews the games of the two departed, tries to divine the impact of the chaotic second Tribal, then examines the expected fates of Tai's idols and the remaining six contestants. Dan finds Sierra's loyalty ultimately led to her downfall, previews the three players he sees as most likely to depart in the next episode's double boot, and someone whose winner chances are rising. Dan examines Zeke's fall, Sierra's safety, Andrea's rise, and the looming battle for Final Tribal Council supremacy as the end of Game Changers draws ever closer. Or more accurately, a wretch, three queens, and a king, as Dan looks at thrones and groans from Episode 5 of Game Changers, "Dirty Deed." Plus a look ahead at the swap and idols galore. Dan examines the conflict between prior game reputation and twists that require snap decisions, as in the Malcolm-booting Tribal Council in this week's episode of Game Changers. Then he takes a brief look at a few rising and falling players. Dan explores how some of the old players are finding new life... changing their games, even... in the "Survivor Jackpot" episode of Survivor: Game Changers. Dan delves into the first chapter of the contestants' character archetypes, and how they've changed, or not, from their previous form in the premiere of Survivor: Game Changers. Leap into the game as Dan examines the character archetypes the Game Changers cast have previously represented, and forecasts their potential success in Season 34. A prologue, of sorts, in which Dan lays out the format and scope of his new column. Dan shares his background in writing and Survivor, and his plans for examining the narrative and characters of the upcoming Survivor season.